Pricing details for Microsoft’s anticipated entry into the tablet market have emerged, and it looks as if the Surface will be very competitively priced against the iPad, right out of the gate: a 32GB Surface will cost the same as a 16GB new iPad at $499. And if you bundle the 32GB Surface with the new Touch cover, the 32GB Surface costs exactly the same as a 32GB iPad without a Smart Cover. The Surface tablet maxes out at 64GB with a bundled Touch Cover, and will cost $699, again in line with the 64GB iPad’s $699 entry price, but a better deal if you really want that keyboard-lined cover. That all seems very competitive. Less competitive is the price of the Touch Cover sold separately. While you can get an iPad Smart Cover for as low as $39 (and even less if you buy from Amazon.com), the Touch Cover will cost $119.99 each, and come in five different colors: white, red, black, blue, and pink. Granted, the Smart Cover doesn’t allow you to type on it, but jeez, that’s an expensive cover. What do you think of these prices? I think they look pretty good, and the Surface looks like great hardware. If I was an undecided buyer, I’d give the Surface consideration before Christmas. What about you? 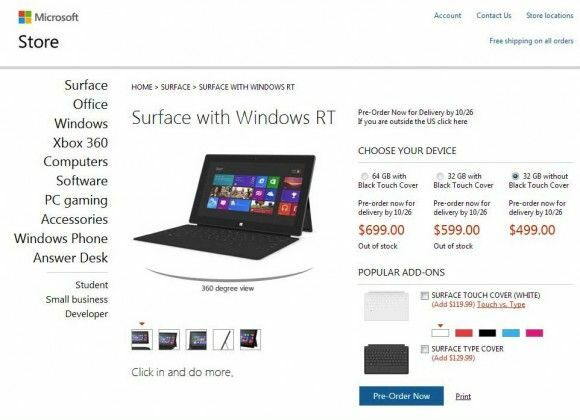 The Microsoft Surface will be available starting October 26th.